God, Can You Help Me? 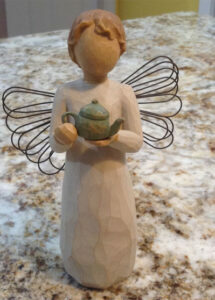 My kitchen angel sits on top of my cabinets, dutifully holding her teapot. Last month I accidentally knocked her off the cabinet and, as I picked up the broken pieces, I noticed this was not the first time she had been knocked off her pedestal, so to speak. 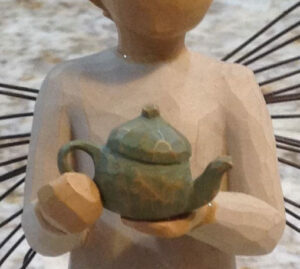 Her head had been glued on and now her hands and tea pot needed to be glued on again! I'm reminded of how often I need to be glued back together. It seems that after every move, I unravel a bit and need that glue to put the pieces of me in place once again. God, in His marvelous timing, answered me with a prompting to look at my kitchen angel. I looked at her, sitting on top of the cabinet, holding her tea pot. From afar, she looked perfect. At closer examination, I could see all the fractures and glue residue from being put back together again and again. It was a visual reminder that I too have been glued together, often at the exact same ‘fracture’ points, and still dealing with the same weaknesses that I thought were taken care of a while ago. In that instance, I knew God was speaking to me. He sees me ― fractures, glue, and all. I’m so thankful that there is a God who loves me so much and faithfully glues me back together. He never gets tired of hearing me cry to Him, “Can you help me?” He "heals the brokenhearted and binds up their wounds" (Psalm 147:3) and gives me His "all-surpassing power" (2 Cor 4:7). Friend, no matter where you are today, you need to be reminded that God does not get weary of caring for you. He is ever watchful and attentive to your cry. I want to leave you with this beautiful reminder from 2 Corinthians 4:15-18. All this is for your benefit, so that the grace that is reaching more and more people may cause thanksgiving to overflow to the glory of God. Therefore we do not lose heart. Though outwardly we are wasting away, yet inwardly we are being renewed day by day. …So we fix our eyes not on what is seen, but on what is unseen, since what is seen is temporary, but what is unseen is eternal. God’s got the glue. Give Him the broken parts of your life and He can put you back together… again. Bev is no stranger to moving. 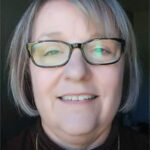 From growing up in the same house to moving every few years in her adult life, she has lived in 12 states and 3 foreign countries with Stan, her wonderful husband of 39 years. After his Army retirement, they happily moved to the same Florida town as their adult kids and spouses and their seven grandchildren. Bev has a heart for the uprooted woman as she, too, continues to embrace her present and look to the future with a firm faith in Jesus. Submit a devotional to Just Moved Ministry. Has God been speaking to you and guiding you through a life change? Send your devotional of 500 words or fewer to akelley@justmoved.org. Each submission will pass through our editorial staff. Include a brief bio and a picture, if you'd like!